In support of National Aviation Day, which according to the national register of official-holidays-that-aren’t-really-holidays is a “federal observance celebrating the advancement and history of aviation,” we present a few of our favorite airplane designs! Happy Aviation Day! Whatever your big news may be, it deserves a special delivery. The airplane icon on these fun notelettes soars to deliver the important message. 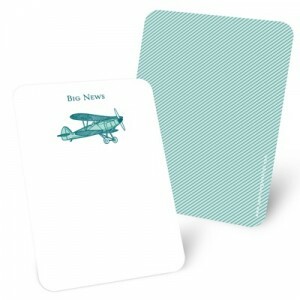 With rounded edges and an aqua striped backside, these greetings are full of color and style! Let the news soar – you’ve moved! 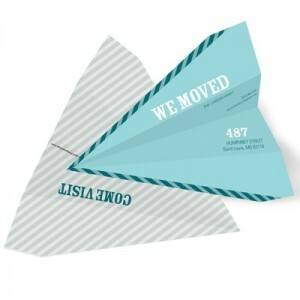 These unique moving announcements are shaped like paper airplanes, offering a fun and creative way to share your big news that your loved ones are sure to remember. Top it off with your choice of colors from a palette of more than 25 options. 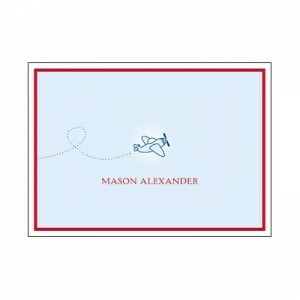 Your gratitude featuring a cute airplane design.